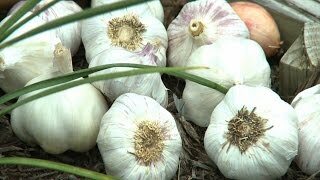 A creole type garlic with long storability through the fall and winter months. This mildly sweet flavored variety produces deliciously tender and mild scapes for mid-season snacking. Harvest fall planted garlic the following season, late spring or early summer, about 240 days from planting. Harvest spring planted garlic the same season, about 90 days from planting. Spanish Benitee is one of the longest storing, staying fresh for 10-11 months. Averages 10 cloves per bulb. Hardneck variety. Garlic, Spanish Benitee is rated 1.0 out of 5 by 2. Rated 1 out of 5 by Mikenna8 from Tasty but terrible grower Bought this for its scapes, which were dry and thin and nearly inedible. Garlic itself was nearly Impossible to harvest as it did not develope a good bulb. What we did get out of the ground has good flavor. Rated 1 out of 5 by Callabrai from Disappointed I planted this according to instructions. 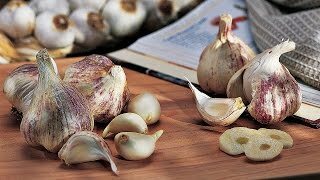 I am not new to growing garlic. This was my first time growing Spanish Benitee though. It is marketed as a hardneck variety, but everything I have read (after research because of the many problems I am having with growing this variety) shows it is genetically a softneck variety. This may be the reason I've had so many problems trying to grow it. I have had at least eight cloves I've planted grow with double sprouts. They were not huge cloves when planted so there was no indication of fused cloves. Most stalks have all yellowed leaves at this point (late April in zone 6). Would not recommend to anyone in my growing area. May be more suitable treated as a soft neck variety in the south. I tried to add a photo but keep getting error message.